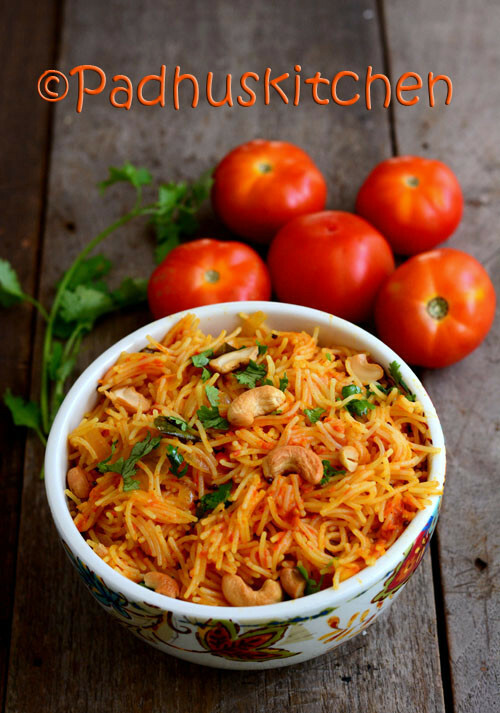 Tomato Semiya/Vermicelli Tomato Bath is a very delicious South Indian breakfast/dinner recipe made with semiya and tomatoes. The procedure is similar to my tomato rice. It can be made quickly and can be had for breakfast or dinner. It also makes a light lunch. If you are bored of eating semiya upma, try this tomato semiya for a change. Today we will learn how to make vermicelli tomato bath following this easy recipe with step wise pictures. Grind 3-4 juicy tomatoes and keep it aside. We need 1 1/4 cup of tomato puree. Fry cashew nuts in a tsp of oil until golden brown and keep it aside. Bring plenty of water to boil with half a tsp of oil and a little salt. When water starts boiling, add the semiya and stir. I used a full pack of savorit semiya 150 grams packet. Cook until it becomes soft but not mushy. Check by tasting it or pressing it with your fingers. Once cooked drain the water completely and pour cold water over it to stop further cooking. Drain the water using a colander and set it aside. Heat oil in a pan, add mustard seeds, when it splutters, add chopped onions and curry leaves. When onion turns transparent, add ginger-garlic paste, green chillies and saute for a few more minutes. Add tomato puree, turmeric powder, sambar powder, salt needed and cook on medium heat. Cook until the rawness of the tomato goes and it starts to leave oil. Add the cooked semiya and mix well so that it is well coated with the tomato mixture. Garnish with coriander leaves, cashew nuts and serve hot with onion raita or pickle. Looks delicious !!! Well presented !!! Do we need to roast vermicelli before boiling?? You can roast it slightly to prevent it from sticking together. Can we try this rice vermicelli? Yes, you can use rice vermicelli.